Enjoy the view from your private deck on a tree house tucked into the trees 6 feet above the ground. The Tree houses offer a full size bed along with a set of bunk beds to sleep a total of 4 people. There is no smoking and no pets allowed in the tree houses. Please bring your own bedding! 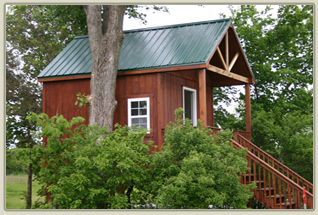 The Tree Houses are air conditioned as well as heated for year round enjoyment. There is a desk, two chairs and room for your belongings. Sorry, no bathroom or kitchen. For restrooms or showers you must use the Campground facilities.